From page 4 of the report: Resilience by Livelihood Zone. Source: based on poverty, land availability, livelihood diversity and climate-sensitivity of income. Individual maps are presented in subsequent chapters. 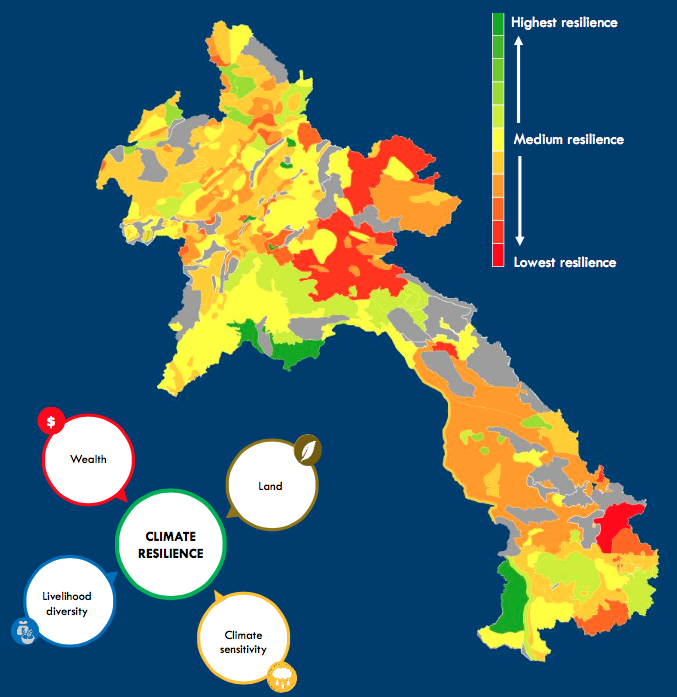 This report*, published jointly by the Ministry of Natural Resources and Environment and WFP, examines the impact of climate change on food security and livelihoods in Laos. It aims to inform climate change adaptation policies and programmes related to food security and livelihoods in the country, and is intended to be used as a tool to identify adaptation options for the most vulnerable livelihoods. The analysis was built on a country-wide livelihood zoning exercise, resulting in the identification of forty unique livelihood groups - each with a unique climate resilience profile. Livelihood zones which are highly diversified, and those which do not rely on rainfed agriculture, are found to be the most resilient to climate shocks. Livelihoods based on rainfed highland paddy production, on the other hand, are amongst the least resilient – not only because they rely on increasingly erratic rainfall, but also because of rugged terrain and remoteness, which limits access to land and alternative livelihood activities. This special report recieved technical support from the USAID’s Mekong Adaptation and Resilience to Climate Change (Mekong ARCC) project, as well as inputs from the Ministry of Agriculture and Forests, Ministry of Planning and Investments, Ministry of Labour and Social Welfare, the United Nations Development Programme, the Food and Agriculture Organisation, the NGO Disaster Risk Reduction and Management consortium (Oxfam, CARE, World Vision, the French Red Cross) and Decide Info. *Download the full report from the right-hand column. Please note that this is an interactive PDF. You can click on the logos of the organisations for more information and you can click on the photographs on the contents page to read the different chapters. The analysis was based on the Consolidated Livelihood Exercise for Analyzing Resilience (CLEAR) analytical approach developed by WFP to better understand how food security is affected by climate risks. This report provides a detailed analysis and national maps of factors influencing communities' resilience, including livelihood zones, resilience profiles, poverty and access to wealth, access to land and livelihood diversity. It also documents the climate sensitivity of Lao PDR in detail, including climate analyses of rainfall climatology, rainfall trends, the start of seasons, seasonality, climate extremes and future climate and crop suitability. The methods used for the mapping and analysis, and descriptions of livelihood profiles are detailed in the annexes. From page 26 of the report: Projected change in drought months (2050, by livelihood zone). Source: Based on USAID Mekong ARCC (2014) Climate Change Impact and Adaptation Study for the Lower Mekong Basin. Livelihoods in Lao PDR are diverse owing to a complex topography and the flows of the Mekong River basin. Over 40 unique livelihood groups exist in the country, each with a unique resilience profile. The livelihoods with greatest climate resilience are those with sufficient access to financial capital (and wealth) and land, those which are highly diversified, and those which do not rely on rainfed agriculture. Focusing on activities linked to these characteristics will enhance community resilience. Generally, livelihoods dependent on highland paddy are among the least resilient in part due to the rugged terrain and remoteness which limits access to land and additional livelihood activities. Communities dependent on highland paddy are also among the most severely affected by climate-related risks. Long-term climate trends: decreases in rainfall in the northern parts of the country can affect the ability of households to engage in rainfed agriculture in the absence of irrigation or water harvesting technology. Seasonal variability: delays in the onset of the rainy season in central and eastern Lao PDR would have detrimental consequences for paddy production. In addition, shorter but more intense rainy seasons increase flood risk. This generates a dual risk of increased drought and flood risk in the same area. Extreme climate events: changes in seasonality are likely to exacerbate drought and flood risk which would have detrimental consequences for most livelihoods. Damage to critical assets is a significant risk. Future climate: increases in rainfall together with more frequent heavy rainfall events will increase flood risk—particularly in southern Lao PDR. At the same time, higher temperatures in the dry season will increase the magnitude of dry spells and droughts. The combination of more rainfall and higher temperatures will affect crop suitability of paddy, coffee, cassava, and maize. From page 9 of the report: Woman weaving. The production of this special report has been made possible through the generous contribution of the Government of Sweden through C-ADAPT. C-ADAPT is a strategic global initiative that aims to strengthen the capacity of WFP and partners to deliver climate services to the most vulnerable and food insecure communities and build resilience to climate-related risks through effective climate risk analysis, adaptation planning, and risk management. C-ADAPT is funded by the Government of Sweden’s fast-track climate finance. The World Food Programme is the world's largest humanitarian agency fighting hunger worldwide. This article provides introduces 'maladaptation' as a concept, explains its pertinence and explores examples of how the term has been applied. This project is a knowledge assessment study designed to synthesise the frameworks, processes and methods being used to assess vulnerability in Europe. This BRACED guide aims to make the findings of the IPCC Special Report on the ‘impacts of global warming of 1.5°C global greenhouse gas emission pathways' more accessible. Summary of key findings from the Deltas, Vulnerability and Climate Change: Migration and Adaptation (DECCMA) project which ran 2014-2018 and focused on African and Asian deltas. This article provides a brief overview of and introduction to the concept of resilience, and links to further reading and examples. Oxfam’s one stop guide to support programme staff to integrate Climate Change Adaptation into their work.